In this excellent article, Nish Anil describes how to modify controls using Effects – a lighter weight approach than creating custom renderers. His examples, however, are all in C#, so I decided to translate them into XAML. To begin I created a new Xamarin.Forms project named xamlEffects. There are two parts to creating the effect. The first is platform dependent. Optionally, create a folder in the iOS project named Platform. In that folder, add a file named RedSliderEffect.cs. You’ll also create files named BlueSliderEffect and GreenSliderEffect. Notice that we override two methods: OnAttached and OnDetached. The idea is that the effect extends the control, and so we attach the effect to the control we wish to extend and then detach and clean up if needed after we’re done. 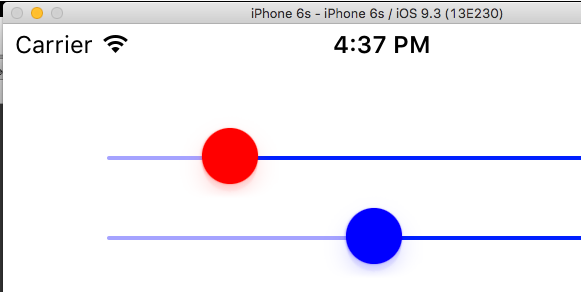 In this code, we’re setting the slider to a red dot on a blue line. The important thing to notice are the two attributes. The first, ResolutionGroupName is only entered once per program. The second, ExportEffect is used once per effect. The name of the effect is the concatenation of the two; in this case EffectsSample.RedSliderEffect. That’s all there is to it. This allows for significant changes to a control without creating custom renderers, a meaningful savings in development time and complexity. This entry was posted in Essentials, Xamarin, XAML. Bookmark the permalink.